As I mentioned in my “coming back” post, I’m going to try to incorporate posts about my new role as a mom so I thought a mom-themed post on Mondays would be a great balance. I love alliteration. After my first week back to work, I was thrilled to spend the weekend with Z and EJ. I soaked up every minute of my time with the Z-monster and I was thrilled to be here for her first giggle-fest. It was music to my ears. I swear EJ and I were beaming for hours after the fact and those 5 minutes made my day. This weekend I was also able to carve out some time to do something that I’ve been looking forward to since we found out that we were expecting, make baby food. I don’t know why but I’ve always been excited (hello dorky lady) to make my own baby food. And I’m here to tell you that it is not only extremely easy, it can also be ridiculously cheap if you grow your own produce or buy it locally while in season. 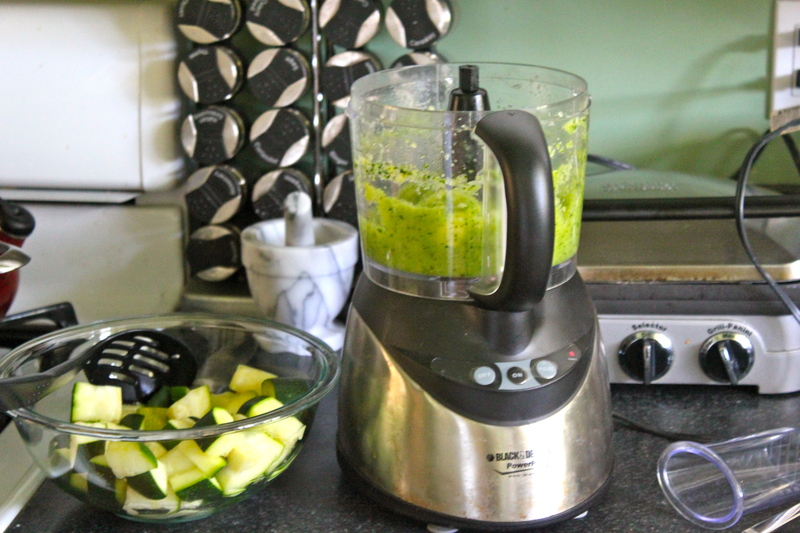 This was actually my second batch of zucchini and summer squash puree. Our zucchini plant has been working overtime in our garden AND my sister was kind enough to gift us her garden leftovers as well. I followed the Cooking for Baby cookbook recipe to make both batches and I can’t stress how easy it was. Step One: Fill your pot with about one inch of water and boil. 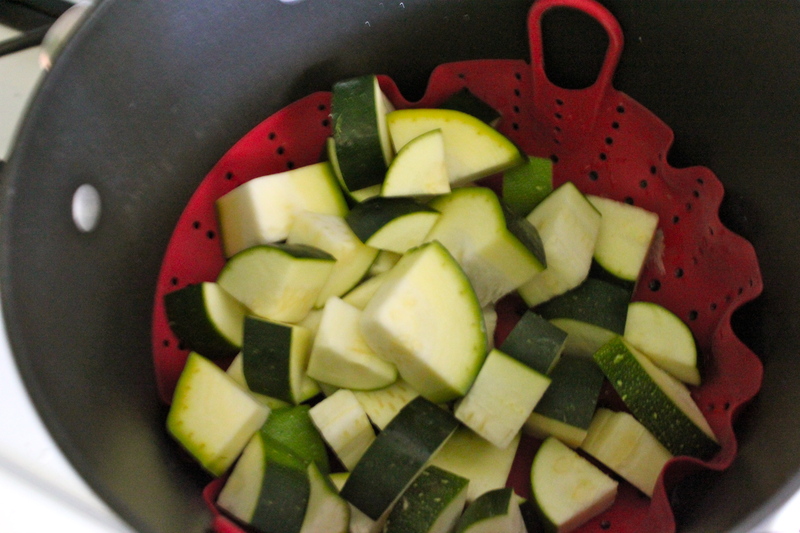 (I place my veggie steamer into the pot while bring the water to a boil) This took about 3-3 1/2 cups of water. 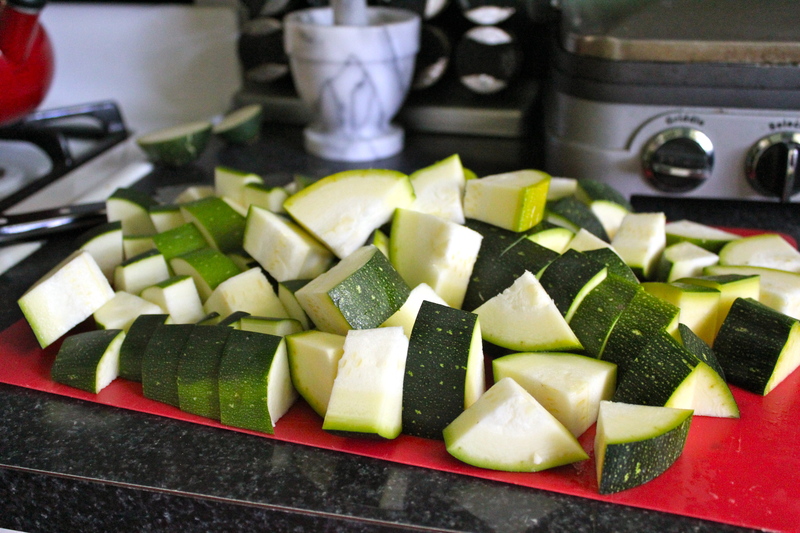 Step Three: Place chopped zucchini into the pot and cover. Let sit for 9-11 minutes. *One of my zucchini’s was mammoth so it took me about 14 minutes. 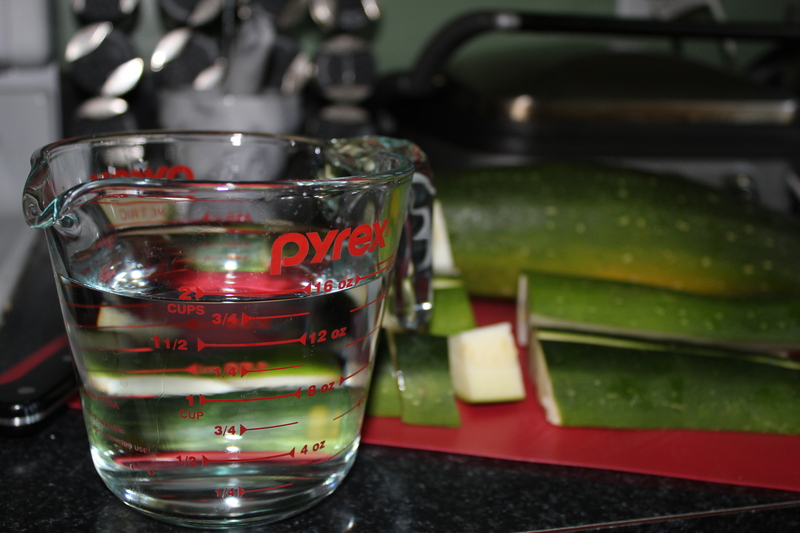 Make sure the squash is soft before transferring it. 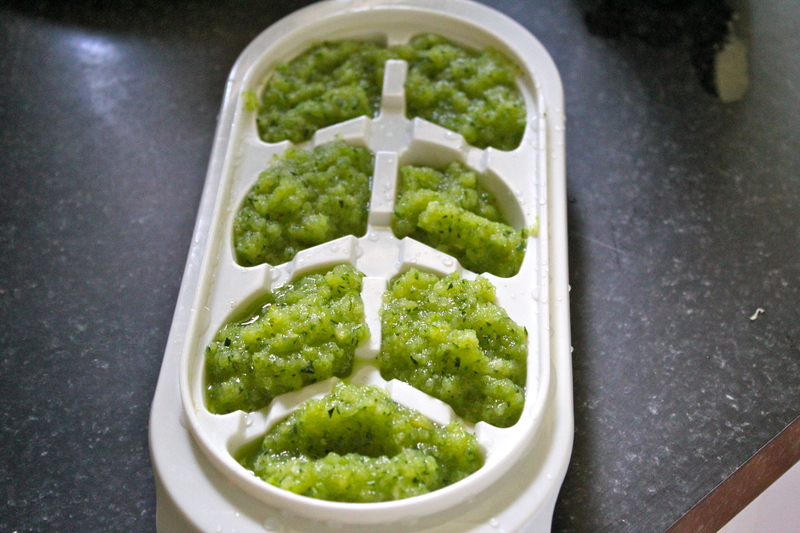 Step Five (last one): Transfer puree into ice-cube trays and place in the freezer until frozen (duh!). This takes about 8 hours for me, but I need them pretty firm so I can transfer them into a ziploc bag. Truth be told I have zero clue how much this actually yields because Z isn’t eating solids (are we really calling the picture above a solid?) yet. I’ll have to do a follow-up post once she starts actually eating the homemade baby food. Next, on my list will be butternut squash and apples. I’m not sure if we will be able to feed her homemade food exclusively while she is transitioning from puree to actual solids, but I would like to give it my best attempt especially since I enjoy making it. Let me know if you have any ideas for my new posting series, I’m thinking my title might be a tad dork, perhaps we’ll shorten to Mom Monday. Happy Monday ladies and gents! 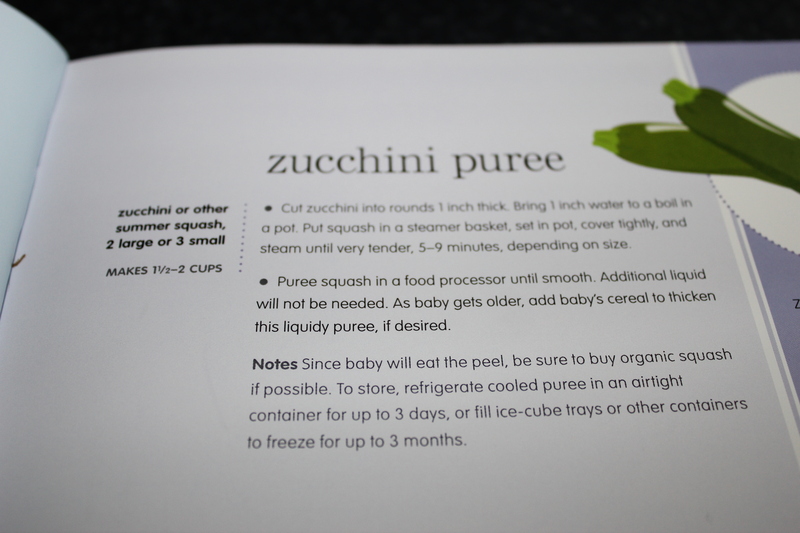 This entry was posted in baby, family, health food, Zoe by gloriousgreens. Bookmark the permalink. As always, it’s a pleasure to read your posts! So glad that you got to see the first gigglefest – I’m sure that there will be many more, and I look forward to seeing my first! Happy Monday right back attcha! 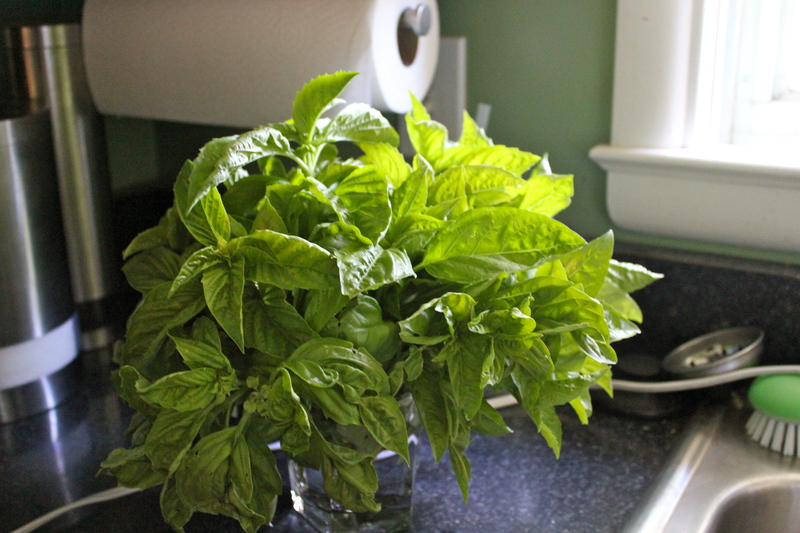 If it were a viable option, I’d say send me some of that pesto! Can’t wait until I have a home where I can have a garden.